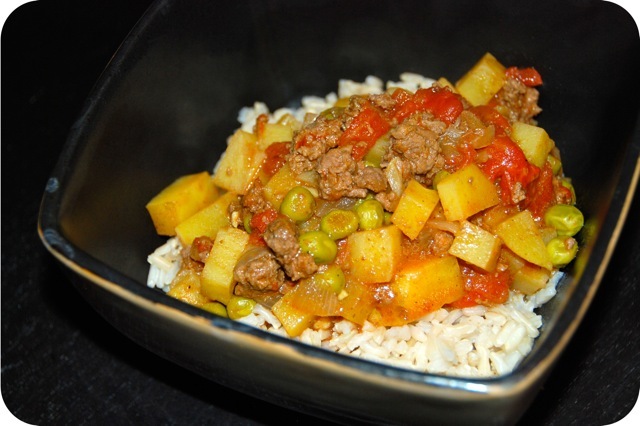 I promised you lots of ground deer/beef recipes so here’s my first to kick things off! Nick’s first deer filled up our freezer, yielding about 12 steaks and maybe 30ish lbs of ground meat. That’s a lot of meat. If you’ve been reading for a while, you know I’m no newbie to cooking with game meat. There is definitely some difference in taste, though I’m pretty used to the flavors now. Still, when I cook with ground deer (or moose), I like to make things with lots of spices (like chili) so that the average dinner guest would never guess they weren’t eating beef. 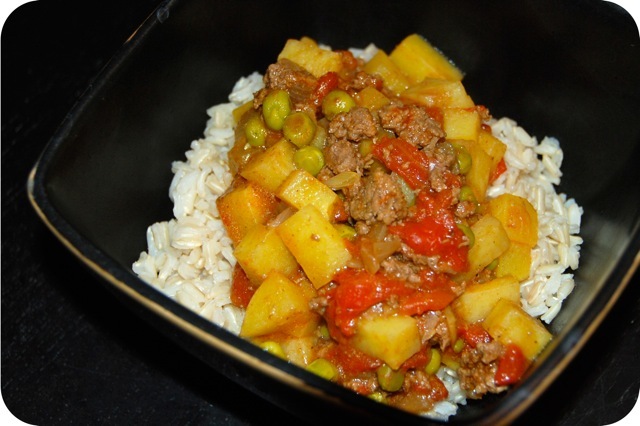 When I saw this Pakistani beef curry, I thought it would be perfect! Nicely spiced! And my, was I right. My sister has a certain affinity for Pakistani food, so I’m kind of sad she moved halfway around the world and couldn’t enjoy this with us! Guess she’ll just have to try out this recipe over there to impress her new Maldivian friends. (Though I’m sure they have some killer curry recipes that could blow this out of the water). In other news, is anyone else too annoyed to go on Facebook during the debates? I’ve shared this on Facebook before, but it’s just too good not to post again. Haha. For reals. 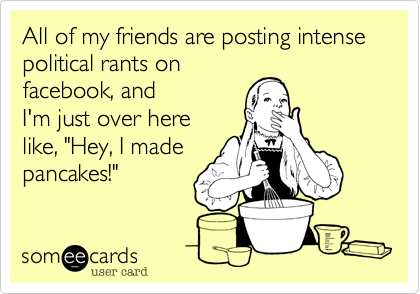 No one cares about your rants, people. But my posts about cookies and cupcakes and chili? Obviously, you all love them. Heat oil in a dutch oven over medium heat. Add onions and garlic and cook until beginning to soften, about 5 minutes. Add beef/venison and cook until browned and cooked through. Drain excess grease. Stir in spices and season with salt and pepper. 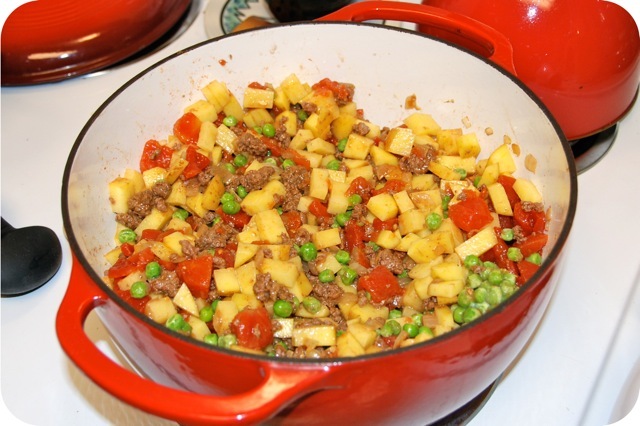 Add tomatoes, potatoes and peas. Stir and bring to a boil. 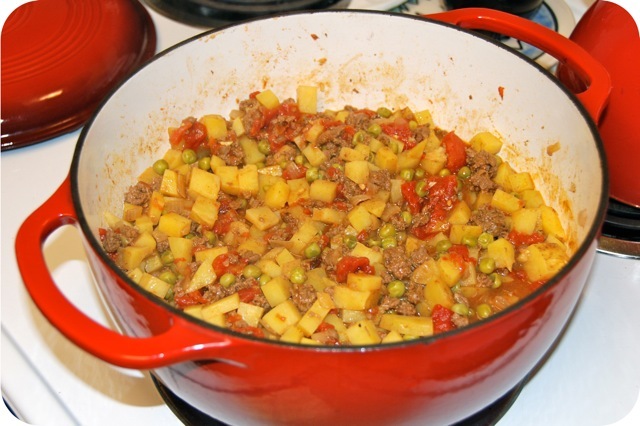 Reduce heat and simmer 25-30 minutes, until potatoes are soft. This dish was awesome! I mean, it’s carbs on top of carbs, how could it be bad? I actually thought it was kind of weird to serve such a potato-heavy dish over rice, but… it totally worked! The spices were great and there was no gamey flavor at all. I loved that this meal was pretty quick to put together and cook, but I bet it would be really great in the crock pot as well. This would also be a great meal to make ahead and freeze in meal-sized portions. This looks sooo yummy! The most I have cooked here so far is cous cous so you’ll have to make it when I come home. I am definitely getting my fill of curry here. They always have curry and hot dogs for breakfast. Normal. You should look up masooni roshi. It’s another popular breakfast here that I’m obsessed with. I don’t know if I spelled it right but it’s ground coconut and fish with onions and flat bread. Who’d have thunk it? Fish for breakfast… I was going to say that was weird until I realized my all time favorite brunch food is bagels and lox! Ok, so I have a technical question about the venison. Who does the meat skinning/slicing/grinding? I imagine Nick coming home and slapping a giant deer on the kitchen table for you to cook with. Are there people who’ll do the gross parts for you? Can you take a deer to a butcher, or is it a DIY situation? Or are you just a major badass? Haha! Good question. Well… he hunts out in the country at his friend’s house. So he skinned and beheaded(?) the deer there. It came to my house as gigantic pieces of meat with bones. Kind of gross, but, as long as the head and fur are gone, I can deal. It has to sit in a cooler full of ice (or a fridge, but, let’s be serious, that ish is not going in my fridge) for a couple days, apparently, til rigor mortis is gone. Then I allow him to use my kitchen (carefully) to debone the meat and cut the meat into smaller chunks. Then we use the KitchenAid grinder attachment to grind everything but the best steaks (backstrap and tenderloins). We remove all of the deer fat before grinding (apparently that’s what makes it gamey)– though it’s pretty lean to begin with– and add ground beef fat (special request from the butcher at the supermarket) to give it some flavor. Then we vacuum pack everything and freeze it! But…. there are totally places who will do this for you. It just wouldn’t be as badass. That’s serious. You’re totally a badass. U can go to a butcher after the deer is field dressed ie. gutted. The butcher may offer to mix the venison with a little beef or pork. If you don’t enjoy the gaminess of venison use pork at 25 to 30 percent. He will cut it up anyway u like. My favorite is to have the whole deer ground up for burger then keep the tenderloin and back straps freeze wrapped in 6” pieces. If you have a desire venison summer sausage is great. A real favorite. NOTE: taking a deer to the butcher is easy and low cost. Where I live venison blackstrap costs about $20 per pound in the grocery store. I have my entire deer processed for about $100, no muss no fuss. I just hopped over from Recipe Newz. This looks great! 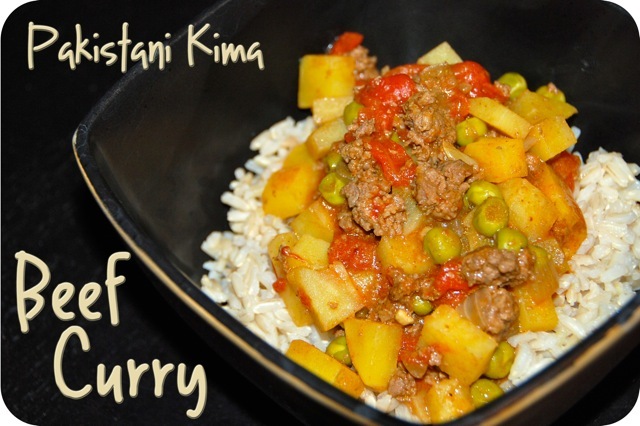 My husband has been requesting more curry dishes and I have been searching for beef ones, perfect. I will be trying this in the near future. Only with ground beef because I don’t have any venison. Fantastic how much meat you got from the deer. I would love if you would share this terrific recipe on foodie friday today. I think there are many people who would be interested in it. Just wanted to comment and say I made this recipe tonight and it was utterly delicious. I used leftover venison roast and threw it in at the end, and it was lovely. I hadn’t come across your blog before, but you have a new reader now. Thank you for posting this. Hooray! So glad you liked it… this was a super delicious flavorful one! I am making my second batch of this for this evening’s supper. Wife isn’t a real curry fan, but she’ll eat a portion. I really like it. as does my son in law. I added a bit more cayenne this time, as I thought it was a bit mild the first time I made it. 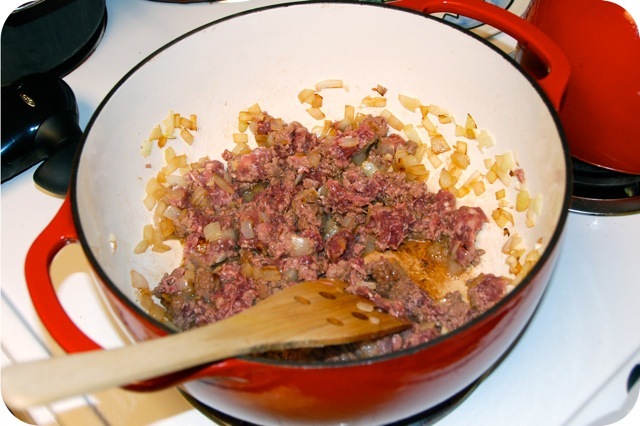 I’m using ground moose, and, since when you shoot a moose, you get a lot of ground meat, I’ll be making this again and again!! Reheats well, too. I have this recipe from the book “More With Less”. The author of that book puts coconut on her Kima. I’ve tried it and it was GOOD! You might try it sometime.